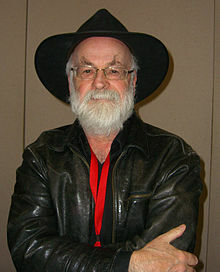 Sir Terry Pratchett, fantasy author and creator of the “Disworld Series” has died aged 66 of Alheimer’s disease. Loved by millions for his irreverent take on life, he satirized politics, religion and anything else he deemed to be flawed and pretensious. Often compared to classic authors like Jonathan Swift and Kurt Vonnegut. He wrote 70 books, his most popular novel being, ironically “Mort”, his “Bromeliad Trilogy” is often regarded by critics and fans alike as works of genius. His career spanned over 40 years and his books where translated into 37 languages, worldwide sales totalled over 70 million volumes. He was Britain’s second most read fantasy author after J.K. Rowling. Famous for his flamboyant dress and black fedora hat, he faced his diagnoses bravely and with his characteristic humour and worked to shed light on the scourge of Alzheimer’s disease. His death was announced on Friday 12th March from his twitter account with these immortal words spoken by one of his most famous characters, DEATH. “AT LAST, SIR TERRY WE MUST WALK TOGETHER”. This entry was posted in Fiction and tagged Author, Parramatta City Library, reading, Terry Pratchett, Writer by admin. Bookmark the permalink.